Patrick Coleman serves as president and chief executive officer of Coleman Group Consulting, which focuses on increasing the financial health and performance of client organizations through strategic sourcing. As an extension of this work with clients in the nonprofit sector, Patrick and his team developed GiveCentral, a web-based donation platform designed to improve fundraising efforts by making it easier for donors to give, for nonprofits to connect with donors and for administrators to efficiently manage it all. Patrick is a strong advocate for the disadvantaged in the community. He has served as board president for the United Way of Elk Grove Village and as a member of both Talkline/Kidsline and Public Action to Deliver Shelter (PADS) Boards. His diverse educational pursuits include a Master of Management Degree from Northwestern University; a Master of Divinity and Baccalaureate in sacred theology from University of St. Mary of the Lake, and a B.S. in foreign service from Georgetown University. 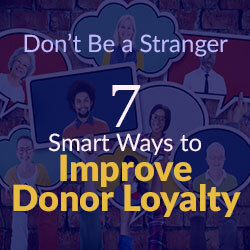 How do you hold a donor’s attention these days? As more nonprofits use digital technology to step up their development efforts, donors have all kinds of causes competing for their generosity. So it may be no surprise that in 2014, according to the Fundraising Effectiveness Project, “The greatest losses in gift dollars came from downgraded and lapsed repeat gifts.” In fact, every $100 that nonprofits gained from new donations was offset by $92 from previous donors who stopped giving. That’s ten steps forward, 9.2 steps backward. Some estimate that obtaining a new donor costs five times as much as retaining an existing one. Figures like this are driving more nonprofits to focus on donor retention, and rightly so. The good news? You can make a big difference in your organization’s donor retention with a modest—but consistent—effort from your staff. There are three things you only have to do once to optimize your fundraising operation for long-term giving. Make evergreen giving the default choice. When a donor sets up their donation, their first or default choice should be a repeating gift with no end date. Framing the giving options this way can gently suggest to your donors that they choose to give more over time. Also, check that your online donation system does not ask the donor to set an arbitrary end date. Set up active notifications. A personal touch goes a long way when reaching out to your donors—the handwritten invitation, the personal email, the warm greeting at your wine-tasting event—but let’s face it, some things are better left to automation. A donor should be notified immediately if their payment fails for any reason, or if the credit card your office has on file is about to expire. Any delay in telling your donors can mean one or two lost gifts, or worse, the end of that person’s regular giving. Enable automatic account updates. Nothing is more annoying than finding out that your credit card was compromised and needs to be replaced. Now you have to remember every place that you use your credit card online, find your username and password, log in and change it—right? Fortunately, that’s changing. Today you can choose a donation portal that will automatically update your donors’ credit cards whenever they are replaced. This feature was pioneered by the major credit card companies to help businesses retain customers who make repeated bill payments—now it’s available for nonprofits with long-term donors too. Dedicate some of your staff’s time every month to these four activities. Say “thank you.” The most effective and easy thing you can do is to thank your donors for their support. Remember that a donor isn’t a customer or a distant investor; they are a person willingly giving something of their own to your organization. Thanking them is a way to not only reinforce their generous actions, but to cultivate a relationship with them over time. Send a personalized email or letter for every donation (though keep it limited to once per month for your more frequent donors). Share your news. Your donors are shareholders in your success, so keep them briefed on what’s going on. Spend 20 minutes each month writing a quick update on what is happening at your organization and send it to all your email contacts. Slow news month? Share a picture of your staff hard at work, with two or three sentences explaining how those donations are helping. One study shows that 53% of donors stop giving due to a lack of communication from the nonprofit—20 minutes is all it takes to make them feel involved. Reach out to your lapsed donors. No matter their reasons for stopping, all of your lapsed donors have at least one thing in common: at some point they were moved enough by your cause to give their money to your organization. Take your monthly update message and modify it slightly for your list of former donors, including a brief appeal for donations at the end. This is much easier if you have a donation program that can quickly generate a contact list of your former donors. Create opportunities for repeat giving. There’s a good chance that a donor who gives your organization $100 today can give about that much every month. Each month, do a quick audit of every place your donors have an opportunity to give: the link on your website, the sign-in desk at your annual auction, the street fundraising team. Make sure that each of these interactions includes a tactful request for repeat giving: “Thank you for your contribution! Would you like to support our mission by making this same gift every month?” When you see your donors in person, I recommend the GiveCentral Go card reader and mobile app, which lets you swipe a donor’s credit card and set up repeating donations in only a few seconds. It is never too late to ask your former donors to come back, and it’s never too early to prevent them from leaving in the first place. You can make a big difference in your donors’ loyalty by choosing the right online tools and communicating every month.